Last night, I found myself sitting in someone's living room with around 40 other strangers, listening to Brendan Begley & Caoimhín Ó Raghallaigh, two amazing Irish folk musicians, playing their hearts out on the fiddle and accordion. It was an amazing experience. The music got into my bones, making me want to dance and clap my hands, or sob uncontrollably. 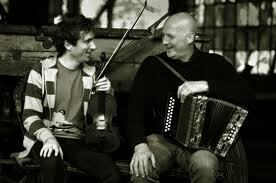 The combination of Brendan Begley's slightly rough, melodious voice and meticulous accordion keywork and Caoimhín Ó Raghallaigh soft-spoken and glitter-fingered fiddle playing created an atmosphere that both took me out of the present moment and kept me pinioned within it. What I didn't go to the Mountain View House Concert Series prepared to discover is how longstanding the culture of house concerts is down in Silicon Valley. Daniel Steinberg has been putting on monthly concerts of music of wildly eclectic genres series at his home in Mountain View for the last 14 years. His core audience is very blasé about the whole thing. It's just part of everyday life for them, it seems. I also found out that there's a monthly Celtic Singalong session that happens at an assortment of private homes between San Francisco and San Jose. Who knew? I signed up for the mailing list. Half of last night's audience seemed to be Irish music enthusiasts. Daniel asked for people in the audience to raise their hands if they played an Irish instrument and at least a quarter of the room responded. Crazy. I felt like I was in County Kerry, not California. Hey, thanks for gorgeous words on this article about Silicon Valley, im waiting for you next ones, im also writer, read my article here http://www.instantshift.com/2015/10/22/apps-for-design-science/ If you like it, please share.